Lots of caravanners often mains electricity to power a range of appliances while attached to an electric hook-up (EHU) on campsites. This is a best practice guide to how caravan electrics work and using the electricity supply safely. For information on how to hook up to the mains, take a look at our handy guide. The distribution and supply of electrical power in the UK, as well as wiring installations in buildings, caravan sites and caravans is governed by the British Standard BS7671, 2001. All Caravan and Motorhome Club sites, where mains is available, have socket outlets which comply with this standard. Most of those on Club sites have a ‘plug in and turn clockwise’ action. On Certificated Locations and other sites the plug may simply push straight in. You should have a completed and signed Electrical Installation Certificate issued by a ‘competent person’. These should be originals, giving details of the caravan (make, model and VIN number) and signed by a ‘competent person’ - photocopies are not acceptable. The maximum permitted distance between socket outlet and any point on the caravan pitch is 20 metres. The hook up lead should be 25 metres (+/- 2 metres) of flexible cable supplied by the caravan manufacturer. One end connects to the caravan inlet, the other plugs into the site socket. Adaptors are also available to connect the standard connecting cable to a domestic 13A socket, so that the caravan can be connected to a house power supply while being stored at home. The domestic plug must be connected inside the house, or in a suitable weatherproof enclosure outside. Whenever possible, use only appliances complying with British Standards with BEAB approval. Other appliances made by well-known manufacturers and sold by reputable traders may be suitable, but if in doubt, ask the manufacturer if the appliance can be used in a caravan. Although the caravan installation is designed for a maximum current of 16 Amp, some sites may limit the maximum current loading per caravan to a lower figure, usually 10 Amp in the UK and sometimes 5 Amp or less. On arrival at a site, check the maximum permitted current, and make sure you don't exceed this figure. Exceeding this figure will result in tripped circuit breakers - at the site rather than in the caravan, which causes inconvenience not only to you, but also your fellow caravanners and the site wardens. Appliance power consumption is quoted in watts and kilowatts (1 kilowatt (kW) = 1000 watts (w)). A total electrical load of 1 kW will require a 5 Amp supply at 230V. Hence the normal supply of 16 Amp in the UK would be suitable for a total load of approximately 3 kW (although this may exceed the circuit limitations of the caravan). The average domestic kettle with power consumption in excess of 2 kW may not be usable with outlets limited to 10 Amp. Lower consumption kettles are available at any caravan accessory shop. Why not take a look at our Club Shop - members save 10%. In the UK, Club site staff have authority to refuse to offer a power supply to a caravan if it is believed that the installation may be unsafe. The caravan mains electrical system should be checked regularly - annually if you cover high mileages. Keep your equipment in good order and have appliances serviced as recommended by the manufacturer. Damaged or worn cables should be replaced immediately. Do not abuse appliances by forcing them to perform in excess of their capability. Switch off ALL internal appliances before connecting to or disconnecting from site supply. Check operation of RCD (residual current device) using the test button every time caravan is connected to a site supply (NOTE: Supply must be switched on at site socket outlet). In the event of a blown fuse or MCB (miniature circuit breaker) trip, switch off the supply and find the cause before replacing the fuse or resetting MCB. If an appliance malfunctions, switch off supply before removing the appliance for inspection. Always make sure the caravan-to-site connecting cable is fully unwound when used. If necessary, lay out any excess cable in parallel rows (not tight coils) beside the caravan. Failure to do this can result in the cable overheating and even catching fire. Motorhomers must not leave cables plugged in on pitches while their vehicle is away from the site during the day. This creates a major safety hazard for wardens when grass cutting, or for children (and others) who might pick up the live end of the cable. Disconnect the cable and coil it next to the bollard (or take it with you) and use a suitable sign to reserve your pitch. Electricity on continental European sites is usually 220V nominal, but in practice can be considerably less. Most appliances sold in the UK are rated at 220-240V and usually work just fine when abroad. Some high-powered equipment, such as microwave ovens, may not function well - consult the appliance handbook for further information. You might be offered a choice of Amp allowances. Check our guide for common appliances or you can work it out more accurately by noting the wattage of each appliance in your caravan. The kettle given is the caravan type, not a household kettle which usually has at least a 2000-watt element. Note that each caravan circuit also has a maximum Amp rating which should not be exceeded. France - a two-pin plus earth socket - this is the most common type of adaptor available from UK caravan accessory shops. Germany - the two-pin plus two earth strips - found in the Netherlands, Norway and Sweden. Adaptors can often be borrowed from the campsite office. Even when the site connector is to EN60309-2, UK caravanners can still encounter the problem known as reversed polarity. 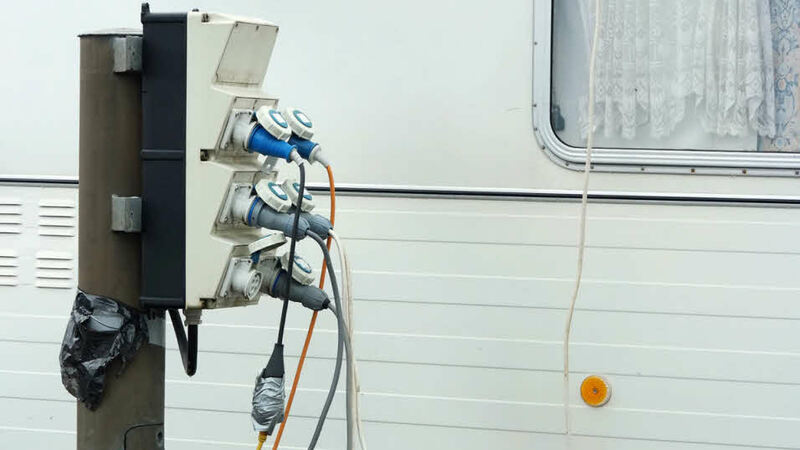 This is where the site supply's 'live' line connects to the caravans 'neutral' and vice versa and is due to different standards of plug and socket wiring that exist in other countries. We therefore recommend checking the polarity immediately on connection, using a polarity tester. The caravan mains electrical installation should not be used while a reversed polarity situation exists. Disconnect from the mains and try another connection point on the site supply – sometimes this resolves the problem. Some members make or buy a short polarity-reversing adapter lead to use in such circumstances. If the reversed polarity cannot be resolved, do not use the supply, as the electrical safety within your outfit will be compromised. Also, never use a site without an earthing system.